Looking For A Lombard Remodeling Contractor? Remodeling an older home brings new style and functionality to meet the current needs of the family. Do you have an old tub, shower, cabinets, and floors in your bathroom? Are your kitchen countertops scratched and faded? Are you tired of the old style or the trouble you have when working in your kitchen? Remodeling can change everything to suit you and the family perfectly. Every surface in the home can be renovated to your unique tastes. The family room and kitchen can be transformed into a better place for gathering, the bathroom can be sparkling new, and the flooring and paint throughout the entire home can be completely updated. Are you planning to remodel? Have you thought about the design style or determined which rooms you want to start with? Have you found a good Lombard remodeling contractor? If you’ve been dreaming about remodeling your Lombard home, consider taking advantage of the services provided by Best Home Renovations. We would love to sit down with you to discuss your needs. We can take care of everything, including helping you create a great design plan. At Best Home Renovations, our remodeling contractors will handle every aspect of your Lombard Remodeling project. The kitchen is one of the best places to start if you need to renovate your home. So many uses are incorporated into kitchens today including study space for kids, hobby space, family gathering space, drinks and entertainment space, and more. Remodeling is equally about aesthetics and function. The layout of a kitchen is vital for successful access during cooking. When everything is difficult to get to or doesn’t support the tools you need to prep and cook food, working in the kitchen can be frustrating and disconcerting. The good news is that the position of every item in the kitchen can be changed for smoother operations. With the right Lombard remodeling contractor, your kitchen can be completely remodeled to the space of your dreams. 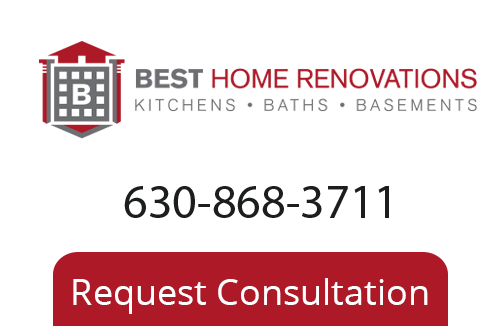 If you are wondering where to begin on your bathroom remodeling project, the best place to start is to call Best Home Renovations. It doesn’t cost anything to sit with us for a moment to talk about your needs. You’ll have a free estimate and all the advice you need to get started from our experts. What you change in the bathroom is completely up to you. Sometimes it’s easier to say what you don’t like than what you may want. Whether you have a new design in mind or not, our Lombard remodeling team help you from start to finish. If you are looking for a Lombard Remodeling Contractor, please call 630-868-3711, or fill out our online request form.